For productivity and performance, La Pavoni Pub 2V is way ahead of the competition. Made to meet the highest standards, this La Pavoni espresso maker produces enough volume to meet your needs with 2 Coffee Groups to double productivity. Pre-infusion of the coffee grounds leads to consistency and balance in each shot of coffee. Due to thermal stability technology, each coffee group performs at a reliable and constant temperature. The direct connection to your water line makes it unnecessary to fill the La Pavoni Espresso maker's water tank by hand. It's an electronic programmable dosing La Pavoni espresso maker with digital control pad and microprocessor that brews continuously for four cup size selections with an instant-stop button. Two double portafilters with 2 coffee baskets each makes up to 400 drinks daily. Mounted gauge to monitor boiler pressure, vertical infusion chamber and pressurization system which eliminates group dripping. 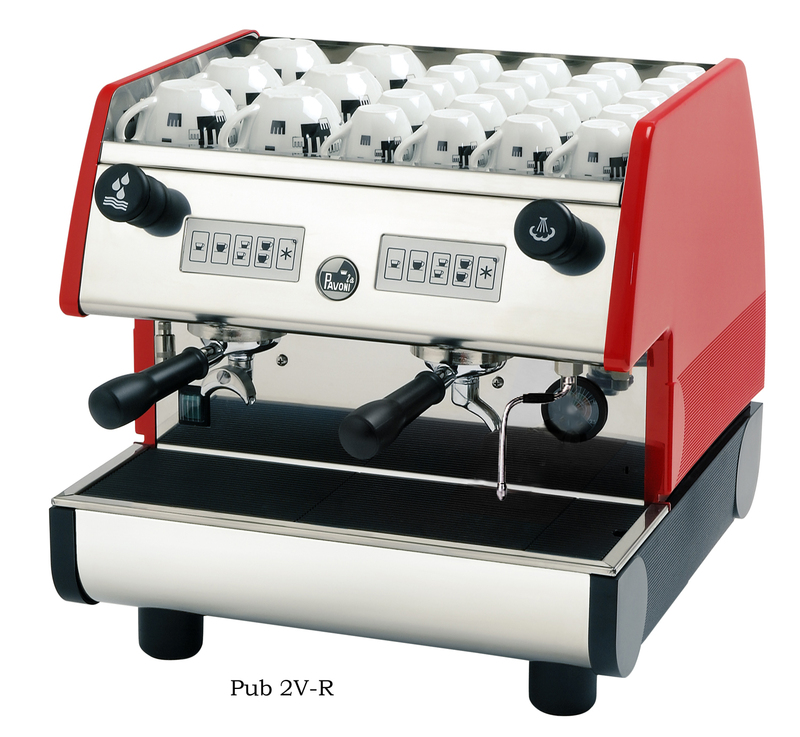 The La Pavoni Pub 2V delivers the excellence expected from this famous Italian brand. Made in Milan Italy. Side panels available in red or black. An espresso machine is your companies most important purchase, a quality built machine such as the La Pavoni Pub 2V features brand name components such as Parker solenoids, Sirai pressurestat and Procon motors with NSF marking. This is an electronic programmable dosing La Pavoni espresso maker with digital control pad and microprocessor. Four cup size selections including continuous brewing and an instant -stop button. Hot water jet is controlled by Knob. Press- forged nickel brass groups with vertical infusion chamber and pressurization system. One steam wand. Thermal stability: La Pavoni espresso maker with an independent radiator hydraulic system for every group that allows for consistent water circulation throughout the boiler. Two double portafilters with 2 coffee baskets each. PUB2V requires direct water plumbing.